Importance. - This species is one of the most important defoliators of loblolly and shortleaf pine in the south-central states. In heavily infested areas, trees may be completely defoliated in the spring before new shoots have developed. Periodic outbreaks over large areas cause substantial growth loss and reduced tree vigor, but mortality rarely occurs. Identifying the Insect. - Larvae are dull green in color, with black stripes along each side and often two lighter stripes below the heavy ones. They are about 1 inch (25 mm) in length, with brown heads. The adult female has a brown body with black markings and is about 2/5 inch (10 mm) long with a sawlike apparatus for depositing eggs. Larva. (Click for detail. JPG 21K). Identifying the Injury. - Newly hatched larvae feed in groups on the old growth. They consume the soft outer tissue of needles, leaving the remainder to turn reddish brown. Twigs with damaged and discolored needles can be easily seen, and are called "flags". 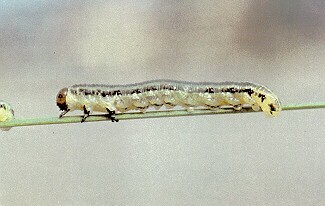 Older larvae feed singly or in pairs and consume the entire needle, leaving short stubs on the branch. Biology. - There is only one generation per year. The overwintering eggs hatch during March and April. Larvae feed for 3 to 4 weeks before dropping to the ground and spinning cocoons in the litter and soil. Pupation takes place in October or November, just prior to adult emergence. After the female mates, she lays a row of 2 to 10 eggs in the middle portion of each needle, laying between 90 to 120 eggs overall. Control. - Natural enemies and a polyhedrosis virus are very effective at controlling outbreaks. Chemical control would be warranted only after several consecutive years of defoliation in the same timber stand.